On the October 25, 2015 podcast of "The Weekly Worldview", Doug McBurney accessed his "Science — Really?" file for some interesting items. 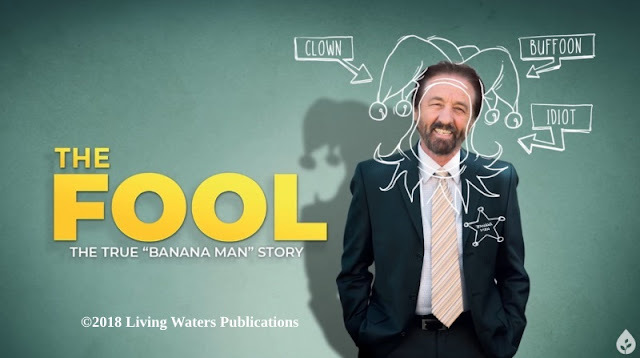 Stuff that fungus-to-fighter evolutionists pass off as valid scientific research is just plumb loco a lot of the time, and Doug had a doozy to share. 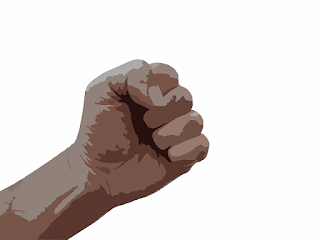 Some owlhoots decided that the human hand evolved the ability to make a fist for the sake of punching an opponent without as much pain. They need to get out of the lab more and experience real life. If you throw a punch with your fingers in the proper position (the picture above is pretty good), that's a start. But if your thumb is sticking out, you risk breaking it when you strike. Also, the proper motion needs to be used for an effective hit. Once again, Darwinoids offer speculation without evidence, and it's based on the presupposition that we were st00pid brutes in the past. Nor do they explain how they know the reason why such alleged evolution happened. But some people just eat this fact-free stuff up and say, "Hail Darwin! Blessed be!" Ain't that a kick in the teeth? Fists are good for pounding on desks, holding someone you're rescuing, cinching up a saddle, working a ratchet, confining an insect, gently holding flower petals, playing drums, or doing other things. An open hand is useful, too — including giving someone a cuff on the back of the head to get them to snap out of the galloping stupids. Or to caress someone you love. The hand is mighty handy because God designed it that way. McBurney went on to discuss how findings on Pluto are baffling long-age cosmologists. (Here are more pieces of information on that, if'n you're looking, Doug.) Shouldn't they have been able to predict this stuff instead of being constantly startled and amazed by what is found all over the solar system? Doug would like a discovery that would utterly destroy the Big Bang idea. Sorry to inflate your bubble to the big banging point, but it won't happen. The Big Bang has been refuted many times already, but they just keep rewiring it, hooking up electrodes to the bolts in its neck, giving it a shock, and then screaming, "It's alive! It's alive!" It's not a matter of science and evidence, but of the will and spiritual condition. People don't want to admit that there's a Creator who makes the rules. In the debate between Christian Greg Bahnsen and atheist Gordon Stein, Dr. Stein was asked what would constitute adequate evidence for God's existence. He said, "If that podium suddenly rose into the air five feet, stayed there for a minute and then dropped right down again, I would say that is evidence of a supernatural because it would violate everything we knew about the laws of physics and chemistry." Dr. Bahnsen pointed out, "People are not made theists by miracles. People must change their world views; their hearts must be changed. They need to be converted. That what it takes, and that's what it would take for Dr. Stein to finally believe it. If this podium rose up five feet off the ground and stayed there, Dr. Stein would eventually have in the future some naturalistic explanation because they believe things on faith, by which I mean that they believe things as which they have not proven by their senses." The source is here, beginning at the 2:07:36 mark, but listening to the entire debate is very enlightening. Anti-theists detest the fact that all have sinned (Rom. 3:23) and have to repent so they can have life through Jesus Christ (Rom. 6:23). So they keep up the naturalism nonsense and think, "Yee ha, by golly, us humans are wise in our own eyes! Who needs God, anyway?" God laughs at such "wisdom" (Rom. 1:22, 1 Cor. 1:20, Psalm 14:1), and we all need God. If you want to hear the podcast (there is political and social commentary after the part I'm going on about, and also some secular rock music clips used in an ironic manner), click on the link way up yonder at the tippy-top. The part I'm going on about it as the 12 minute 46 second mark. And you think I occasionally get sarcastic when telling the blunt truth about bad "science"?